Q.1 Is there an alternative to graphite foil for metallizing? Ans. 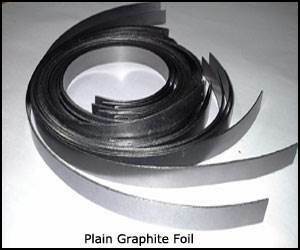 Graphite foil is highly conducting, flexible, compressible and relatively inexpensive. It serves to plug the gap between the evaporation boat and the copper clamp and so prevents any sparking that may take place. There is no alternate to graphite foil as no other material meets all these criterion. Q.2 How should I determine what size of graphite tape I should be using? Ans. Size of graphite tape is defined by the thickness and width. Choice of thickness of graphite tape is based on condition (wear) of copper clamps. In new machines thickness of 0.2mm is normally used. As copper clamps keep wearing, thickness of graphite tape can be increased to 0.35mm and then 0.5mm. 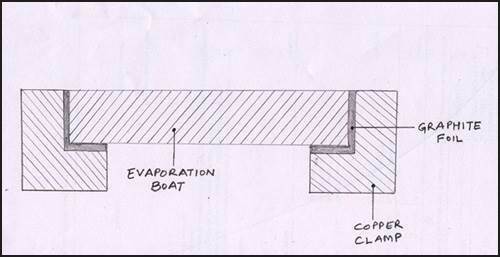 Width of graphite tape is determine by the size of evaporation boats. Q.3 Why use expensive Graphite Foil for a Metallizer? It has to protect the Copper clamp from overheating and melting. For all these functions to be performed efficiently, the graphite foil must be of top quality – packing in denser amounts of graphite per sq.cm. as well as be very pure. Sadly, often for the sake of cost cutting or out of sheer ignorance, cheap, low quality, plumber grade graphite foil is used which leads to disastrous consequences. Plumber grade graphite foil cannot perform the aforementioned functions. This low quality graphite foil is not 100% pure since it is made with binders like resins, adhesives and rubber compounds which start releasing vapors when heated. These vapors bring down the vacuum and also cling to the substrate, thus affecting the quality of metallizing. Q.4 What is the work of graphite foil in metallizing? Ans. Graphite foil is placed between evaporation boat and copper clamp. It’s work is to fill any gaps between the two and provide smooth current flow. 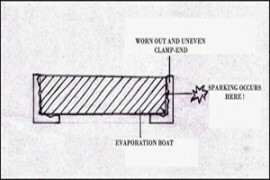 In absence of graphite foil there will be sparking between evaporation boat and clamp resulting in damage to clamp and boat and power wastage. Q.5 How is graphite tape (used in metallizers) made? Ans. A good quality graphite tape is prepared by exfoliating graphite powder and then compressing it under high pressure in a power press. This graphite tape does not have any binders and is therefore most suitable for use in Metallizers. Q.6 Why is graphite foil used with ceramic evaporation boat in metallizing? Ans. Evaporation boats get current from copper clamps and get heated up. Since surface of neither evaporation boat nor copper clamp is perfect so small gaps are left which cause sparking. Graphite foil is put between boat and clamp. This fills any gaps. Further graphite foil is highly conductive so it prevents sparking and ensures copper heating of evaporation boats. Q.7 What are the basic properties of graphite foil used in a metallizer? It should be made of high quality graphite powder not having any impurities. Graphite foil should have been made without using any binders, resins etc. graphite content in this foil should be more than 99%. Graphite foil should have high compressibility. Q.8 What is the difference between special purpose graphite foil used in metallizing and normal graphite foil? Ans. Graphite foil used in metallizer is of very high purity (more than 99%) as it is required to transmit very high current (up to 700 amp). Q. 9 What is the difference between crinkled graphite tape and plain graphite tape? Which is better? Ans. 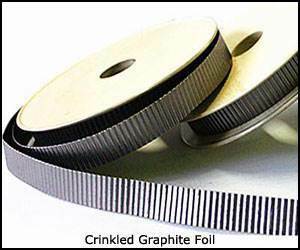 Crinkled graphite tape is corrugated as shown below whereas plain graphite tape has a uniform cross section. Plain graphite tape is better because of its uniform cross section it provides better contact between evaporation boats and copper clamps. 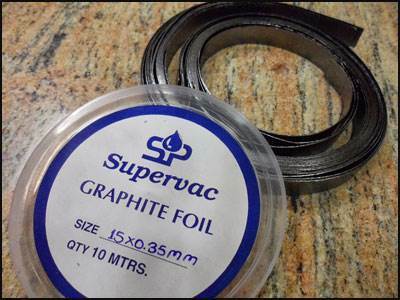 Q.10 Some suppliers supply graphite foil in very long rolls of 30m/50m/100m whereas Supervac supplies in 500mm length. Why is it so? Ans. 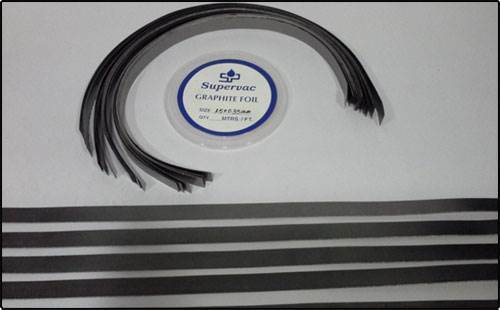 Graphite foils supplied by Supervac are made from 100% pure graphite powder which is pressed into the form of foil by a patented process of exfoliation. Other suppliers who do not have this technology add binders to graphite powder so that it can be rolled into long rolls of 30/50/100 meters. Needless to say binders affect the performance of graphite foil adversely.